Nutrient management has become an integral component of managing a commercial dairy and livestock operation. Specifically, reducing phosphorus content of livestock diets, manure and soil is a common goal of nutrient management programs. As a result, there is considerable interest among dairy and livestock producers, nutrition consultants, crop consultants and nutrient management specialists regarding the accuracy and precision of measuring phosphorus in feed, manure and soil. Taking representative and frequent samples are key to obtaining meaningful phosphorus test results for soil, plant tissue, animal manure, feeds and forages, as well as other materials. Taking a representative sample followed by sound laboratory work are both essential in evaluating feed phosphorus. The accuracy and precision of measuring feed phosphorus is primarily dependent on the laboratory receiving a representative sample. This Focus on Forage article will give and overview of current issues as related to evaluating phosphorus in dairy and livestock feeds and diets. Can dietary phosphorus be determined from sampling a Total Mixed Rations? One of the most convenient ways to evaluate the amount of dietary phosphorus fed to dairy cattle is to send a representative sample of the total mixed ration (TMR) to a laboratory. The Marshfield Soil and Forage Testing Laboratory routinely evaluates TMRs for phosphorus as well as other nutrients. In an evaluation of the first four years of this testing program a steady decline in the average total P content in TMR rations has been observed over time. For the first 100 TMR samples tested during this evaluation period, the average P content was 0.46%. The average P content of 100 random TMRs four years later was 0.42%. However, a wide range of phosphorus content exists in this data set, with the highest and lowest phosphorus contents being 0.91 and 0.22%, respectively. The question then becomes is this variation due to diet formulation, sampling error or laboratory error. Can I use near infra-red reflectance spectroscopy (NIRS) to monitor P content of forages and TMRs? Caution must be used when balancing and evaluating dairy and livestock rations using mineral levels based on NIRS forage analysis. In a study by Peters, et. al., (2001) mineral estimates by NIR were not highly correlated to traditional wet chemistry mineral analyses (Figure 1). In general, NIRS has difficulty in predicting the mineral content of feed samples when mineral content is either very high or very low. 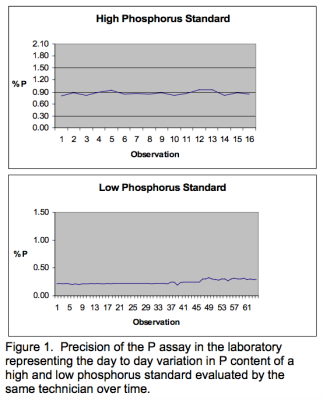 Among the minerals studied, NIRS phosphorus was the most poorly correlated to wet chemistry values. The principle reason NIRS has challenges evaluating mineral content of feeds, forages or TMR’s is because minerals do not absorb light in the near infra-red region. In contrast organic bonds associated with protein and fiber such as C-N or C-0 absorb light in the near infra-red region and as result nutrients such as CP and NDF are well predicted by NIRS. How do I take a good forage or TMR sample to evaluate phosphorus? An excellent publication on taking proper forage and TMR samples is available at https://fyi.extension.wisc.edu/forage/files/2014/01/SamplingTMR-FOF.pdf. 4) send the sample to a reputable laboratory. Using book P values or using only NIRS to evaluate P management programs can lead to significant errors in estimating the P content of forages, diets or TMRs. Peters, J. B., K. A. Kelling, P. E. Speth and P. M. Laskowski. 2001. “Forage Cations as Affected by Soil pH and Topdressed K.” Proceedings of the 2001 Wisconsin Fertilizer, Aglime and Pest Management Conference.